The IHE Patient Care Devices (PCD) domain traces its origins to 2001 when a task force of the American College of Clinical Engineering (ACCE) began working with IHE’s Strategic Development Committee (SDC) to develop a plan to support medical devices. In February of 2005, the SDC ratified ACCE’s proposal to address medical devices, and shortly thereafter the sponsoring organizations formally appointed ACCE to manage this new “Patient Care Devices” domain. That year‘s Annual IHE Survey conducted by HIMSS indicated that most respondents believed that medical devices should be given a priority for inclusion in the IHE. Medical devices held the potential to posed potential connectivity numbers that would quadruple the number of IT devices. Medical devices were rapidly becoming “smarter,” and manufacturers were moving to establish proprietary networking protocols. The time was right for the PCD Domain. Twenty-three clinical engineers from the United States, Canada, and Mexico responded to the initial ACCE call for participation in the new domain. The official launch meeting of the PCD domain in September, 2005, in Washington D.C. was attended by over 60 participants from industry, health care systems, government, and professional societies, as well as delegates from Canada and Europe. Primary goals of the meeting were to define the scope of the domain, to set the domain structure into place, to identify the value propositions of the stakeholders, and to explore the process of using Use Cases to build models for interoperability. The scope of PCD was to span virtually all clinical disciplines, including emergency medicine, anesthesia, intensive care, surgery, OB/GYN, IV Therapy, and others. The long-term goal established for PCD is to facilitate the integration of physiologic data from patients, including measurements, diagnostic test results, and waveforms into the EHR, for application in automated charting, analysis, medical error prevention, etc. PCD profiles also enable integration of important process-related data, such as patient and device location, drug infusion billing, available-bed notifications for resource management, and medical device recall/update management. Many devices are used in multiple clinical contexts, and because of that, the acquired data may have different implications depending upon the clinical setting. Some devices provide life-critical signals and alarms that directly impact patient safety and well-being in real-time, and these messages must be accorded appropriate priority and integrity. Some devices are designed to accompany ambulatory patients throughout a facility, PCD protocols must account for both wireless and wired network connections and be secure from “hacker” and virus intrusions. Medical devices can provide real-time or near-real-time data automatically and accurately incorporated directly into the Electronic Medical Record (EMR). To accomplish its objectives, PCD was organized under two primary committees, (Planning and Technical), directed by a leadership team of co-chairs. The planning committee, co-chaired by Todd Cooper of Breakthrough Solutions and Ray Zambuto of Technology in Medicine, would be responsible for high level planning, surveying the industry, and developing a 5-year roadmap for the domain. The Technical Committee, co-chaired by Cooper and Jack Harrington of Philips Medical Systems, would be responsible for taking the use cases of the Planning Committee and translating these into working documents which the vendors can use in designing IHE compliant systems. The initial leadership team also included Elliot Sloane, PhD of Villanova University, serving as the liaison to the SDC and Emanuel (Manny) Furst, PhD of Imptech Improvement Technologies who served as Technical Coordinator for the domain. The initial goal of PCD was to develop Profiles from the Use Cases for communicating asynchronous data, such as vital signs or point-of-care laboratory test results, to the HER, and for binding a reliable patient identifier to the device/data. Those two initial profiles were tested at the January 2007 Connectathon at RSNA headquarters in Oak Brook IL and demonstrated live at the HIMSS Annual Meeting in New Orleans, February 2007. The data was transferred from/between Vital Signs Monitors, IV Pumps, and Ventilators. Six vendors participated: B Braun, Drager Medical, G.E. Healthcare, Live Data, Philips Medical, and Welch Allyn. Over the last 10 years, the progress of PCD has been remarkable. According to Paul Sherman, of Sherman Engineering, the Technical Coordinator since 2014, 30 vendors participated in the 2018 PCD Connectathon. One hundred thirty-eight (138) products and systems were tested for interoperability under one or more PCD Profiles. Over fifty (50) products and systems, which have passed IHE Connectathons for PCD Profiles are now commercially available. The 2019 PCD Planning Committee chairs are Rob Wilder of SPOK and Kurt Eliason of Smiths Medical and Technical Committee chairs are John Rhodes of Philips and Tom Kowalczyk of B Braun. They preside over a development platform that now numbers 16 Workgroups. Currently, there are 12 PCD Profiles completed or under development. Three of these profiles have had the highest impact in terms of adoption and implementation potential: DEC, ACM, and PIV. DEC (Device Event Communication) is the protocol for seamlessly passing discrete patient information, including identification and vital signs readings, from the point of care to a receiving system, usually the Electronic Health Record. ACM (Alert Communication Management) is the mechanism for alerting end users of a change in condition. These changes can include safety alarms, as well as technical and advisory notifications. ACM’s strength is providing that information to whatever portable communication device the caregiver uses (pager, cell phone, dedicated comms system). PIV (Point-of-Care Infusion Verification) enables infusion parameters to be sent from a Medication Administration System directly to the infusion pump. This increases patient safety by eliminating keystroke errors and increasing the use of “smart pump” automatic dosage checking as well as automated drug library updates. The power of these and other PCD profiles have been significantly enhanced by the development of two significant “tool sets,” the Rosetta Terminology Mapping (RTM) and the NIST Testing Tools. Rosetta Terminology Mapping (RTM) is the primary mechanism to ‘translate’ clinical terms, such as LOINC (used in the US) into internationally recognized standards, specifically ISO/IEEE 11073-10101 nomenclature terms. While medical equipment manufacturers must comply with international standards for trade and liability, there was no cross reference for the terminology, units of measure, or trade names. The importance of this was recognized as early as 2007 by Paul Schluter of G.E. Healthcare. Working with his PCD peers, he began to construct a “Rosetta Stone” for clinical parameters by cross-mapping existing patient information. RTM has grown to now provide a library for new terms and the mechanism to use those terms until they can be incorporated into the international standards. Currently, most physiologic events are mapped as well as over 800 technical terms. Another significant boost to PCD that began in the early years is its relationship with The National Institute of Science and Technology (NIST). John Garguilo at NIST initiated the relationship. He has led the NIST support team as active members of several workgroups, contributing valuable expertise. They designed and host the PCD testing tools used to verify that messages sent can be understood by receiving systems. These tools are used at the Connectathon for formal testing but are available year-round for vendors to test their work and troubleshoot challenges before formal testing. Looking ahead, PCD expects high impact Profiles to emerge in the areas of medical equipment management, ventilator and dialysis management, and real-time waveforms. To support the management of healthcare technology systems by clinical engineering departments, PCD is developing Medical Equipment Management (MEM) and its attendant specialties Device Management (MEMDMC) and Location Services (MEMLS). These profiles will allow the direct posting of equipment status, errors, battery status etc. into the Equipment Management record system. This will enable prediction and mitigation of equipment failures, such as detecting that the batteries in a defibrillator are getting weak. Other risk mitigations made possible are direct posting and identification of software versions and tracking/implementing recalls, particularly for mobile devices like infusion pumps. Ventilator and dialysis system management has the potential to significantly improve patient care. Ventilators deployed for home use are increasing. Providing the clinician with patient status information and machine performance for remote units will be challenging. With the implementation of Device Management protocols, the clinician can triage ventilator alerts and alarms before sending out a caregiver, allowing them to focus on the most urgent issues. A similar concern exists for dialysis equipment in free-standing centers and at home. As dialysis and EHR companies adopt PCD profiles, they will be able to seamlessly provide the caregiver with the most recent treatment information and results, allowing them to focus more fully on the patient. From the first days of PCD, physiologic waveform management was recognized for its importance and challenges. The impact of having waveforms automatically sent to caregivers for alarm response will greatly aid in their decisions. Additionally, directly adding relevant waveforms into a patient record avoids the logistics of printing, scanning, and ‘pasting’ this information into a patient record. It also simplifies long term patient evaluation; enabling direct comparison to track changes over time. Through the Waveform Communication Management (WCM) profile PCD has demonstrated the live transfer of a waveform from a medical device into an EHR. The 2018 Connectathon introduced formal waveform transmission testing. As PCD continues to mature, more manufacturers are incorporating its profiles in their designs. Utilizing IHE based equipment at the hospital will improve patient safety and reduce long term costs. As more profiles are released, it becomes possible to leverage their power in combination to solve complex problems and improve overall performance. For example, smarter alarm systems can be built using information from multiple sources. Equipment-patient-physician associations can track care and improve billing. In a case study reported in 2018, McLaren Healthcare System working with their Real Time Location Services (RTLS) partner and their infusion pump vendor to reduce pump costs, utilized key IHE and PCD profiles. They devised a method to determine IV pump locations, and their utilization by location. In the first year, McLaren was able to re-deploy under-used pumps, reducing the need to purchase pumps and saving over one million dollars above the RTLS purchase cost. With all that has been accomplished, PCD is still only scratching the surface of what it will eventually achieve. The key to its long-term success is found in its Vision Statement, which is as relevant today as it was in 2005. The IHE Patient Care Device Domain (IHE PCD) is the nexus for vendors and providers to jointly define and demonstrate unambiguous interoperability specifications, called profiles, which are based on industry standards, and which can be brought to market. Further information about IHE-PCD can be found on the PCD website https://www.ihe.net/ihe_domains/patient_care_devices/ and the 2017 Webinar Series, “Inside IHE: Patient Care Device” presented by Monroe Pattillo of Practical Health Interoperability, LLC, which can be viewed at https://www.ihe.net/wp-content/uploads/uploadedFiles/Documents/PCD/Inside-IHE-PCD-2017-slides.pdf. 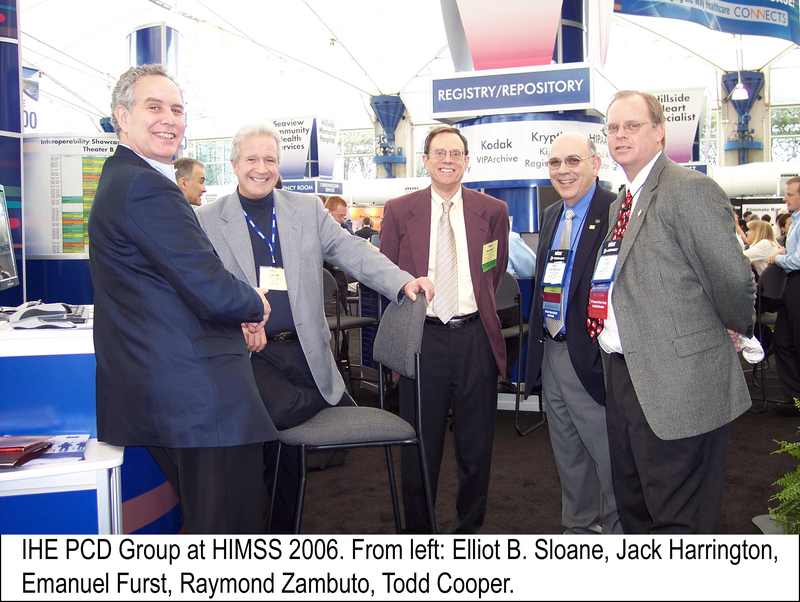 Zambuto, R.P, Sloane, E, “The IHE Initiative”, 24×7, June 2006, pp21-26. Dickey, David “Real ROI: Using RTLS to Improve IV Pump Utilization & Save $1M” HIMSS Annual Conference, March 6, 2018.